Stahl-Electronics offers a 3 year PhD position (start: August/September 2017) aiming at the development of novel super-sensitive charge sensors, which will be used in Ion and Antimatter research. Applicants should have high interest and skills in electronics and physics and like to push things forward. Our company close to Frankfurt works in frontier technologies on a international level. The applicant must have an excellent masters degree in physics, suitable for admission as a PhD student with the University of Heidelberg, Germany. The position is supported by an EU ITN-grant, see also on the EURAXESS website. Stahl-Electronics offers a 3 year PhD position (start: June 2017) aiming at the development of novel super-sensitive charge sensors, which will be used in Ion and Antimatter research. Applicants should have high interest and skills in electronics and physics and like to push things forward. Our company close to Frankfurt works in frontier technologies on a international level. The applicant must have an excellent masters degree in physics, suitable for admission as a PhD student with the University of Heidelberg, Germany. Devices of our HF-D series RF drives ( data sheet: pdf, 1.36 MB) have been improved and offer exceptionally pure RF power signals, suited to power up state of the art traps for ions and molecules. 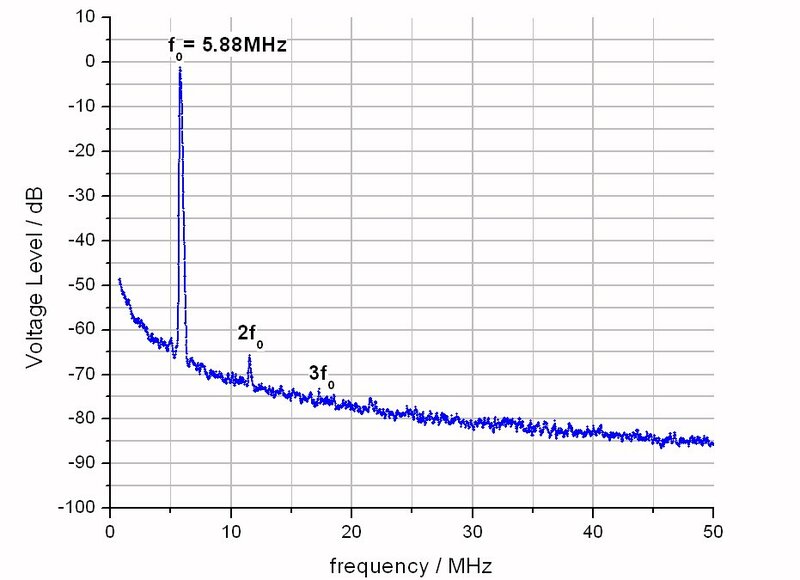 The subsequent figure shows an output spectrum of a customized device. Contact us personally at the WOLTE11, the 11th International Workshop On Low Temperatures Electronics, at the Amphithéâtre Phelma, PHELMA-MINATEC in Grenoble, France. Contact us personally at the WOLTE10 at the Université Paris Diderot, Paris, France (10th International Workshop on Low Temperature Electronics). Stahl-Electronics is now an official member of the Marie Curie Initial Training Network: Cold Molecular Ions at the Quantum limit (COMIQ) as an associated partner. COMIQ is an European Commission funded network focused at educating Early Stage Researchers (ESR) at the PhD level within a range of advanced cooling, trapping, and control techniques with the purpose of developing cold molecular ion research beyond its present state. HFC 50 with improved features available NOW! Fast precision Low Noise Switches available NOW! Highly sensitive voltage preamplifier PR-E 3 - SMA available NOW! Low Noise High Voltage Switches available NOW! Paul Trap field generator available NOW! We are present with a poster presentation at the 60th ASMS Conference on Mass Spectrometry and Allied Topics in Vancouver, BC, Canada. RF drive HF-D 200A available NOW! Purpose of the new RF drive HF-D 200A is the supply of AC-voltages to Paul Traps and other Quadrupoletype electrode setups for ion storage and manipulation. Stahl-Electronics announces collaboration with TU Ilmenau with respect to developing a new high performance versatile STM amplifier for cryogenic temperatures. The device combines low noise (10fA/sqrt Hz) with high speed (DC to 200kHz) and is fully compatible to UHV and cryogenic conditions for STM/AFM applications. UM 1-5/1-14 LN available NOW! The UM 1-5/1-14 LN is the latest family member of our series of 3-channel ultra high precision voltage sources. It features a further improved temperature-coefficient and even less voltage fluctuations on a 10-8 level. The HFC 50 is a low noise cryogenic amplifier for the 0.3 to 40MHz range. It has been developed with special focus on shot noise, tunneling current and QPC measurements at liquid Helium temperature. 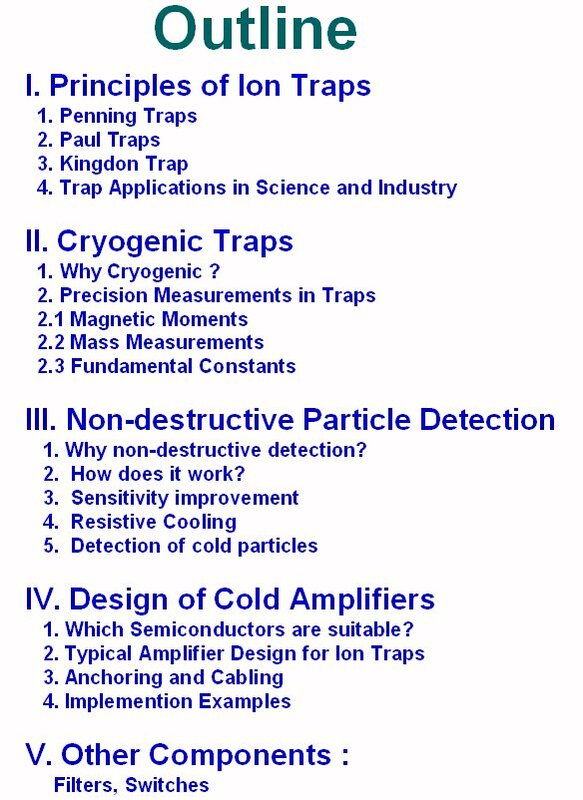 Dr. Stefan Stahl gives a lecture about "Cryogenic Electronics in Ion Traps" at CERN, Geneva, room 13, building 593, 9:00 - 13:30. The BS Series devices provide precise and stable DC voltages up to +/-14V for biasing purposes. On March 13-17, 2011, we are present at the DPG Frühjahrstagung in Dresden, Germany. Contact us in person or by phone (0177-34 34 328). 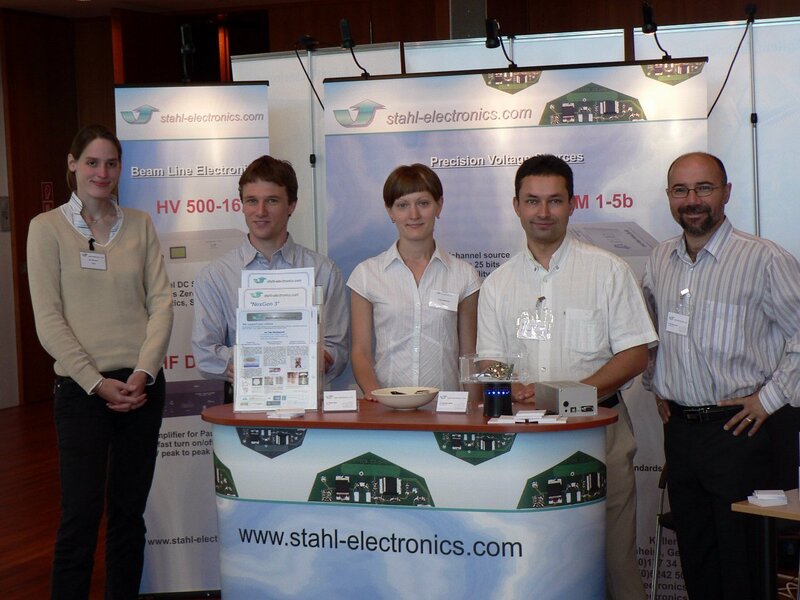 stahl-electronics is an official sponsor of the 11th Symposium on Nuclei in the Cosmos, July 19-23, 2010, Heidelberg, Germany. Dr. Stefan Stahl gives an invited talk with the title "Prospects of Cryogenic Electronics at Accelerators" at 12 a.m. at University of Bilbao, Spain. Dual channel cryogenic low noise amplifier KC 05 du V.09 for low-noise applications available NOW! Highly sensitive voltage preamplifier PR-E 3 for low-noise and high-impedance applications like FT-ICR cells, Schottky pickups or charge detectors available NOW! We are present at the LASPEC-MATS workshop in Matalascañas (Huelva), Spain. Contact us personally at the WOLTE-8 in Jena/Gabelbach, Germany (Eighth International Workshop on Low Temperature Electronics). From 10. - 14. March 2008 in Darmstadt, Germany, the DPG Spring Meeting and the industrial exhibition will take place in the science and congress center Darmstadtium. Last Monday we had successful scientific meetings at CERN. We met Prof. Yamazaki and ISOLTRAP group members and spent around two hours discussing physics and electronics concerning trapping antiparticles. for Ion Compression in Traps with 4 phase shifted outputs up to 20Vpp available NOW! The first specially designed bipolar 16-channel voltage source HV 500-16 recently has been successfully installed and tested at Max Planck Institute for Nuclear Physics, Heidelberg, Group of Dr. Alban Kellerbauer. Our team also successfully installed and tested the first standard bipolar 16-channel voltage source HV 500-16 at Johannes Gutenberg University Mainz, Department of Physics, MATS Group of Dr. habil. Klaus Blaum. Our participation in the ICPEAC 2007 in Freiburg, Germany, was very successful and interesting. We had a lot of visitors at our booth and contacted scientists working in the field of ion traps and accelerators. Meet us at our booth at the ICPEAC 2007 in Freiburg, Germany. Our company will contribute to this conference with a poster presentation. Contact us personally at the EMIS 2007 at Deauville, France. Our company will have a sponsorship of this conference. The ECAMP IX allowed to get in touch with interested scientists. 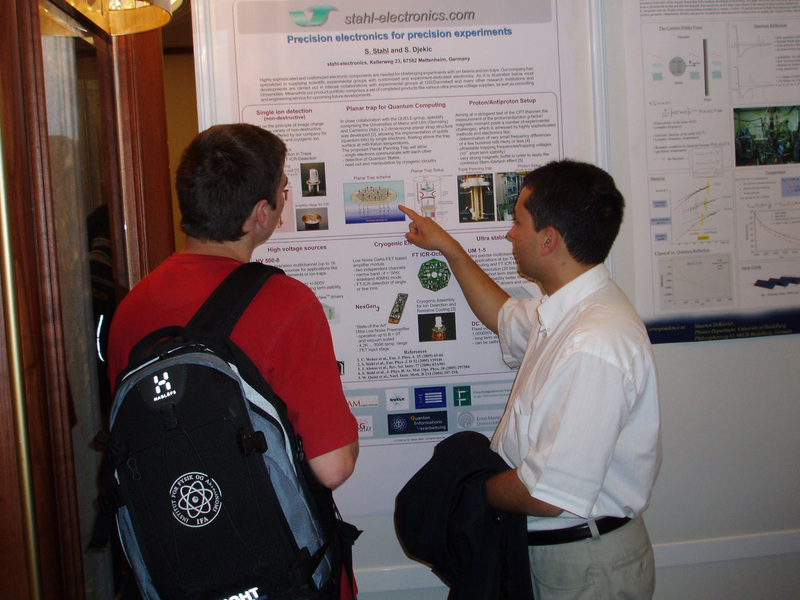 The photo shows Dr. Stefan Stahl during a conversation at the presentation poster. We are present at the ECAMP IX in Crete, Greece. We are present at the DPG Conference - AMOP in Düsseldorf, Germany. Contact us personally at the Third SPARC Workshop in Paris, France. Bipolar multichannel high voltage sources with continuous zero crossing for ion optics and beam lines. 4, 8 and 16-channel versions. UM 1-5 ultrastable bipolar voltage source 25Bit available NOW! NexGen3 KC-05 differential 4.2K cryogenic amplifier available NOW! Contact us personally at the ICAP conference in Innsbruck, Austria. Contact us personally at the WOLTE-7 in Noordwijk, Netherlands (Seventh International Workshop on Low Temperature Electronics). Our staff is present at the International conference on Low Energy Antiproton Physics (LEAP'05) in Bonn - Jülich, Germany. We are represented with several lectures at the Spring Meeting of the Deutschen Physikalischen Gesellschaft in Berlin. We have signed a contract for the development of FT-ICR Ion Traps at the KATRIN-Beamline at the Research Centre Karlsruhe. Our staff is present at the HCI2004-Conference in Vilnius.